Today we’re still talking about the toys in our supply closet! Today we move to the physical therapy part of the closet. We have all kinds of toys that are great for physical therapy, and you can easily find them to use at your home, too. We have lots and lots of balls, of all different kinds. We love to use basketballs because they’re great for bouncing and throwing, but we have balls of all different sizes for all different kinds of games. 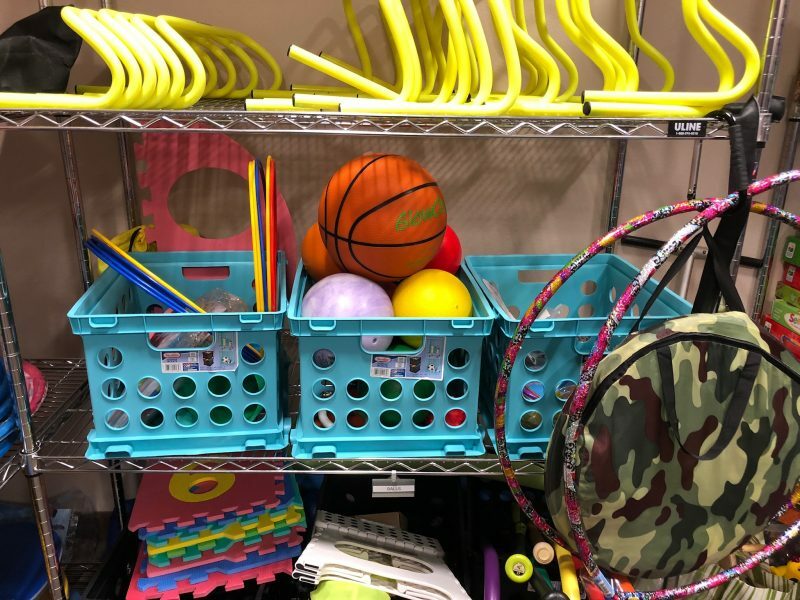 We also have all kinds of things the kids can use to jump with or over, giant tic tac toe games, and colored dots that the kids have to jump to. Games are so important in therapy, and in physical therapy, we use whatever we can to get the kids moving! For physical therapy, we’re never limited by what’s on these shelves. We also create relay races and have the kids build their own obstacle courses. You can do this at home, just with things around your house! We have the kiddos create all kinds of games so that in a therapy session they could go from playing a board game to creating their own game. Therapy can be fun and creative! Ask your therapist if you’d like any ideas on how to use toys and games to practice physical therapy at home. They can give you ideas that will be just right for your kiddo.